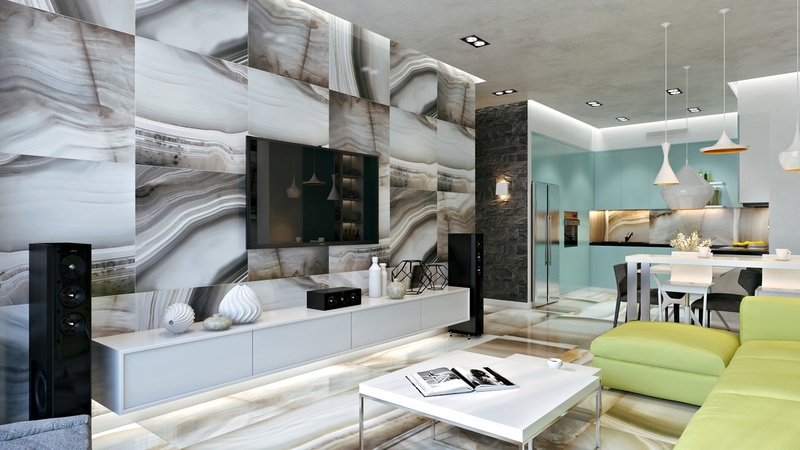 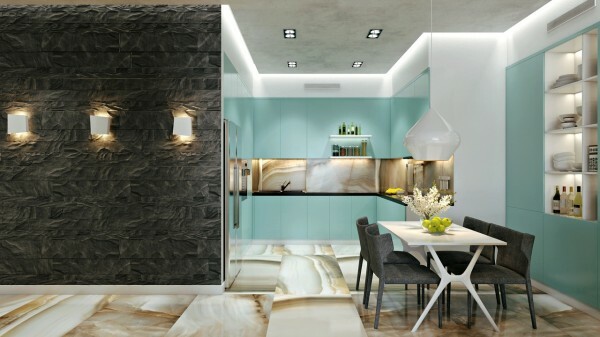 Anyone who believes that interior design is simply a matter of choosing furniture and painting the walls has probably never tried to design a room or a home. 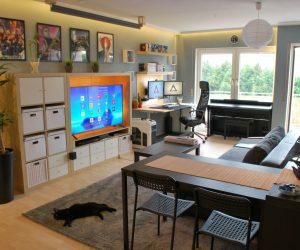 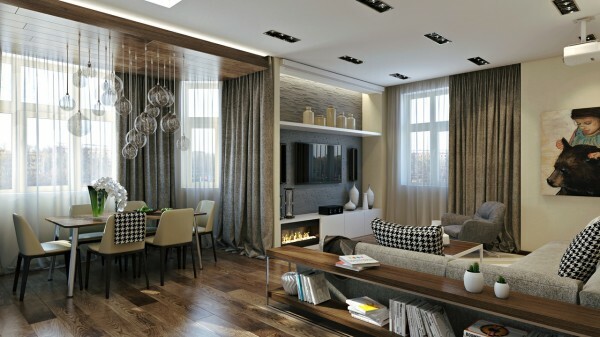 These apartments, each visualized by Archivizer, have so much more than some pretty paint and a cozy sofa. 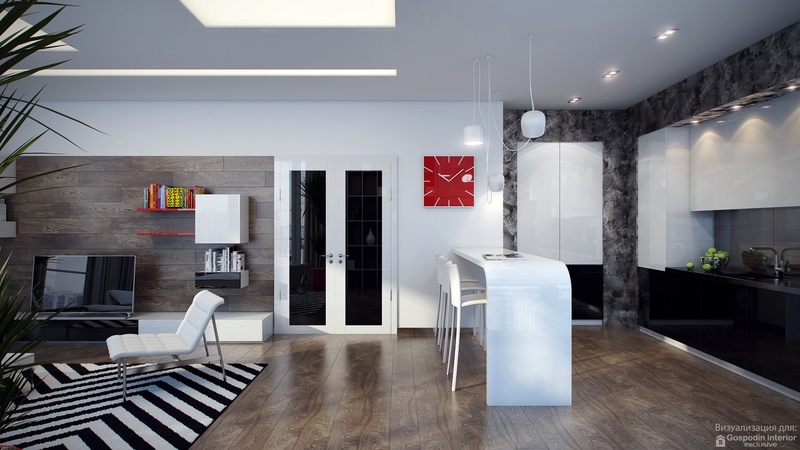 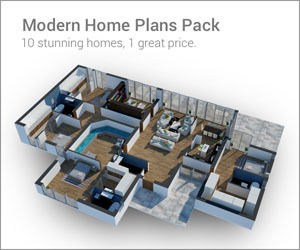 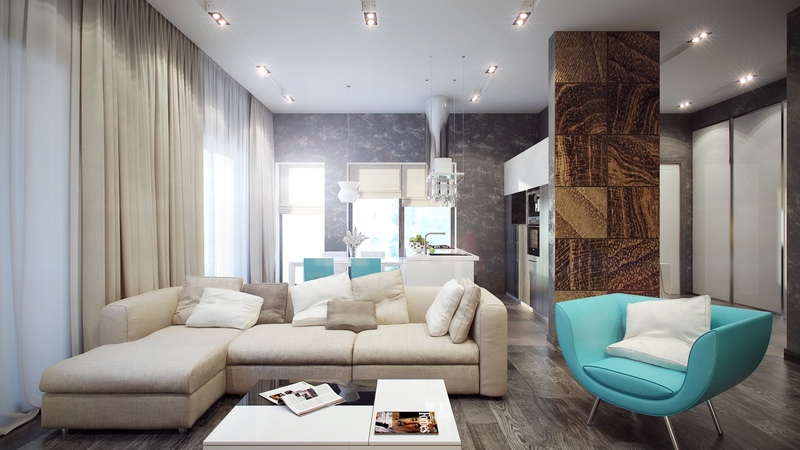 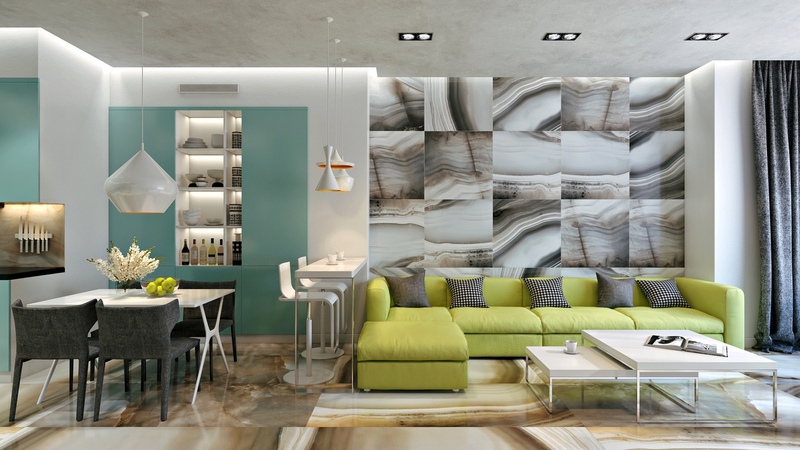 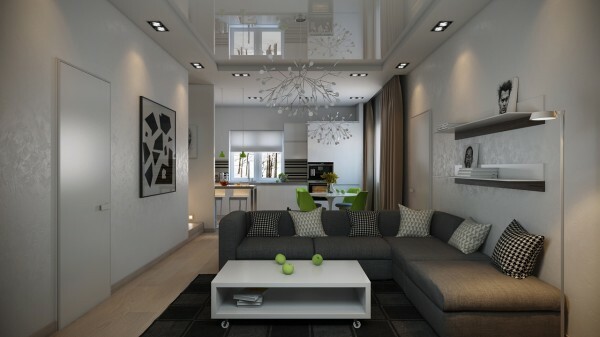 Specifically, these apartments use color and texture to bring a new dimension to the designs. 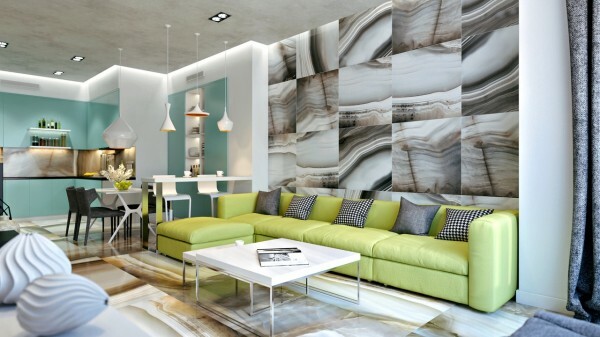 From cool, smooth tile to playfully patterned throw pillows, these apartments take into account all the senses. The results are welcoming, stylish, and far from simple. The first apartment uses colors that remind us of an art deco hotel on Miami Beach. 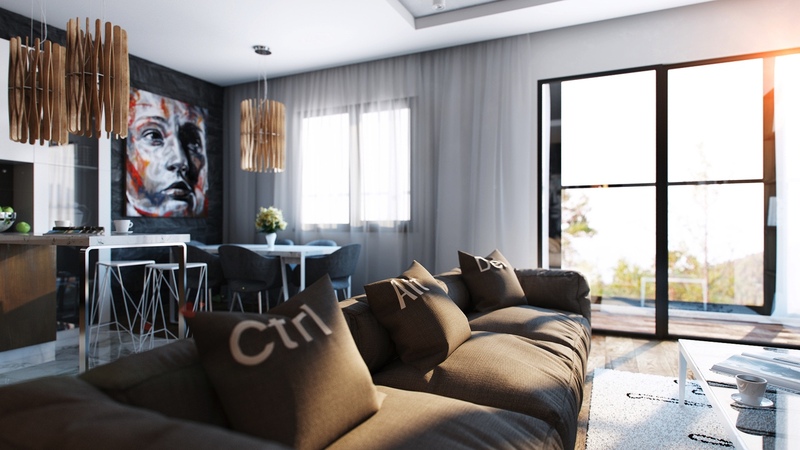 Black and white patterned throw pillows bring a modern zing to the room. The tiled wall and floor have a delicious chocolate brown coloring that mimics the inside of a seashell. 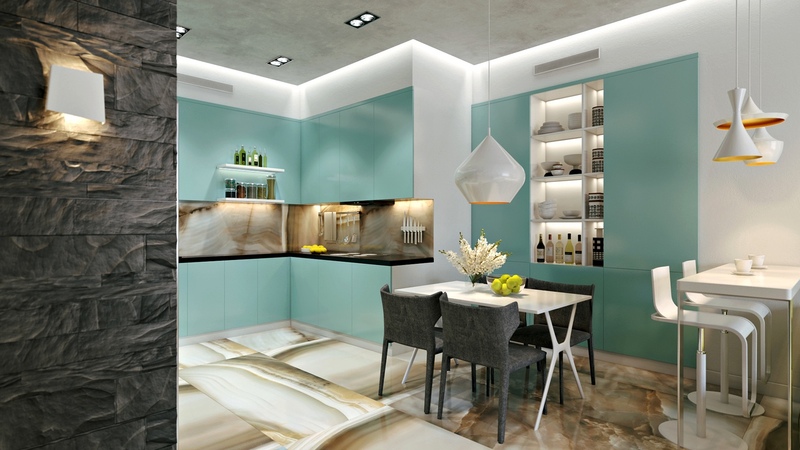 Teal and lime shades complement each other in a surprising way. In this next apartment, the beachy colors are absent but we can still see a particular attention to pattern among the otherwise neutral palette. 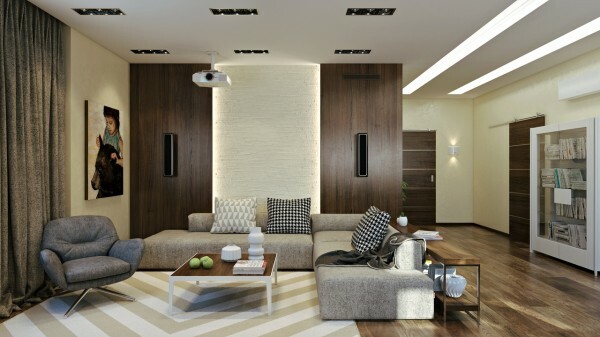 Specifically, this area rug and its bold geometric look, and the accent wall behind the television with its textured design. 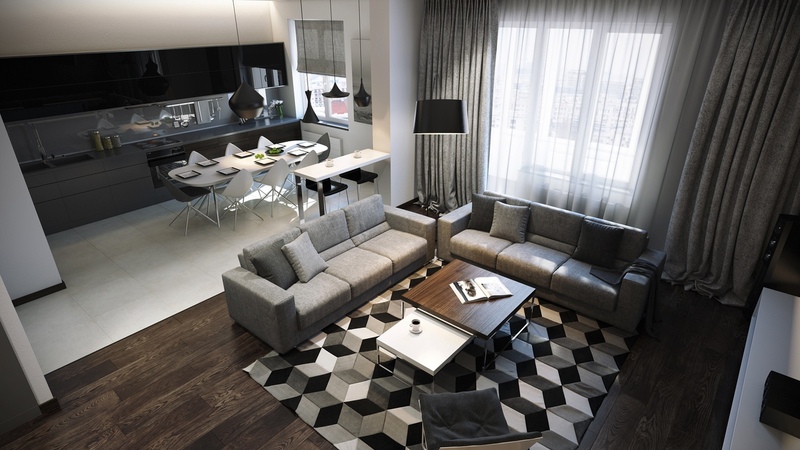 In this space, houndstooth is a running theme. The pattern is certainly trendy but also lends a timeless appeal. This apartment and its lush leather sofa invite you to lounge for house. 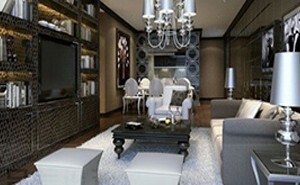 The smooth texture of the sofa along with the appeal of the leather scent is certainly notable. 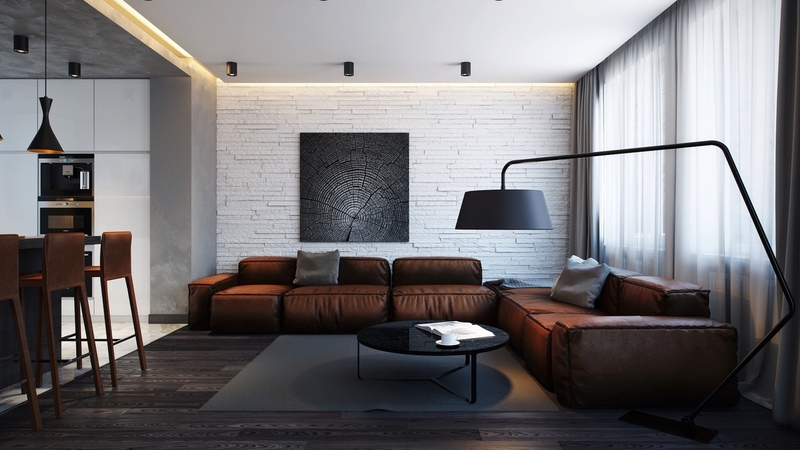 A white brick accent wall creates an interesting texture and is a nod to the stacked wood near the fireplace. This apartment’s living room is dominated by a massive, velvety sofa that’s slate gray and orange. 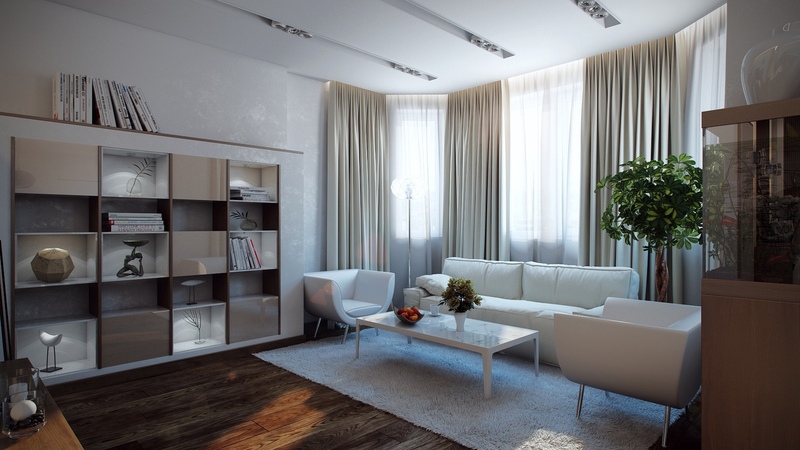 It’s touchable texture makes it difficult to look away, making that space an inviting focal point in the room. 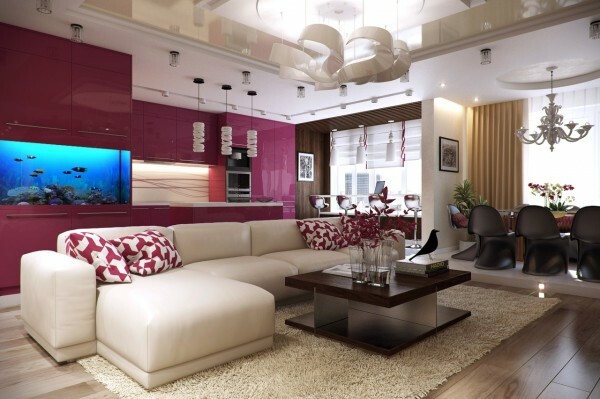 This lovely apartment is a bit more spacious and utilizes reflective surfaces as well as a decadent magenta color to great effect. 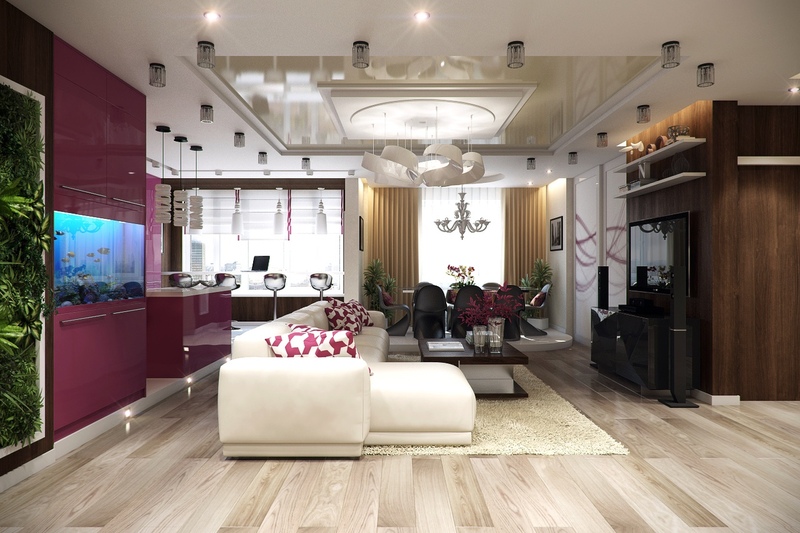 The open floor plan means that the kitchen cabinetry must work with the living room, so the visualizer here has brought the pink into the sofa throw pillows as well as the coffee table centerpiece. 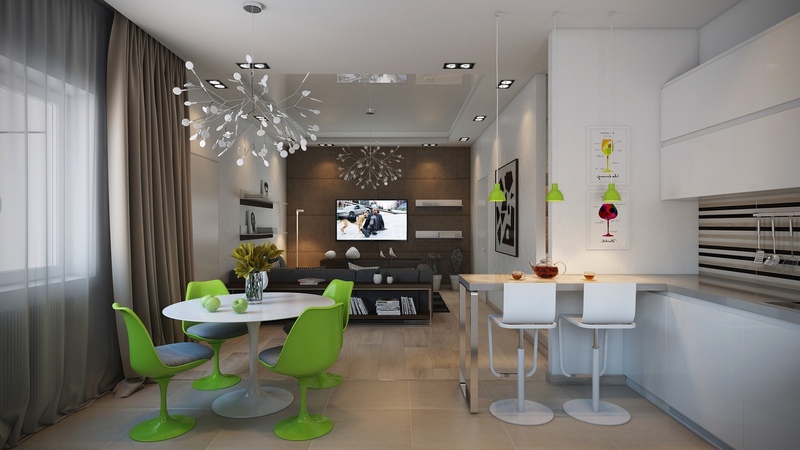 This vibrant apartment uses lime green to make an unmistakable statement. 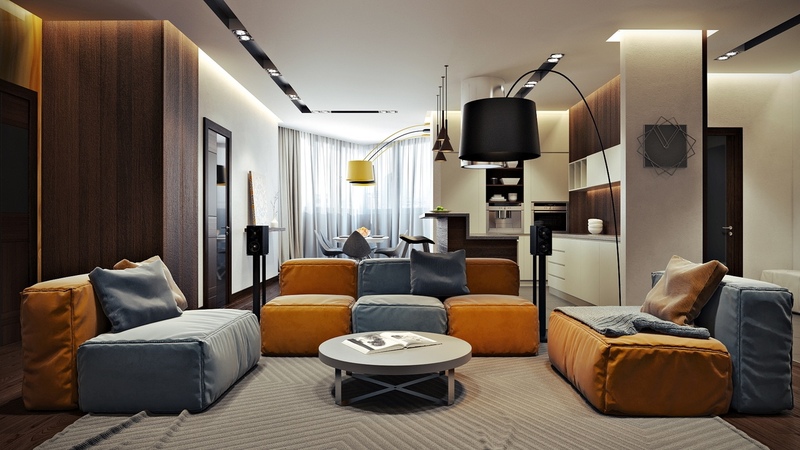 More houndstooth pillows are very of the moment. 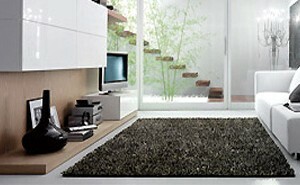 A chevron striped rug speaks volumes about the style of whoever might live here – youthful and fashionable. 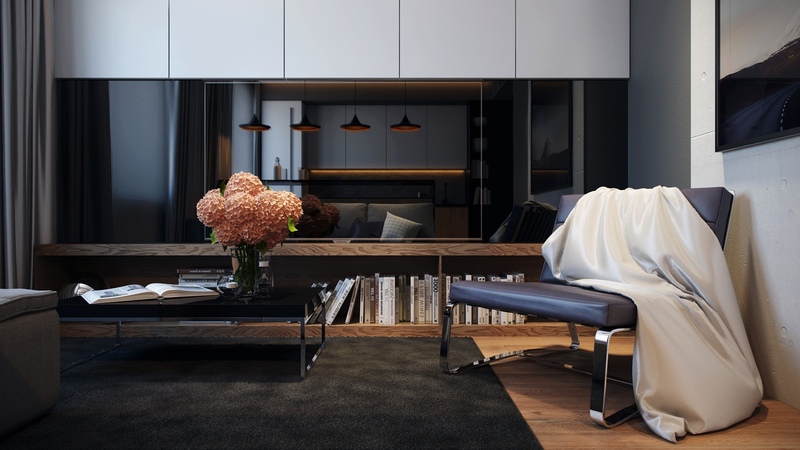 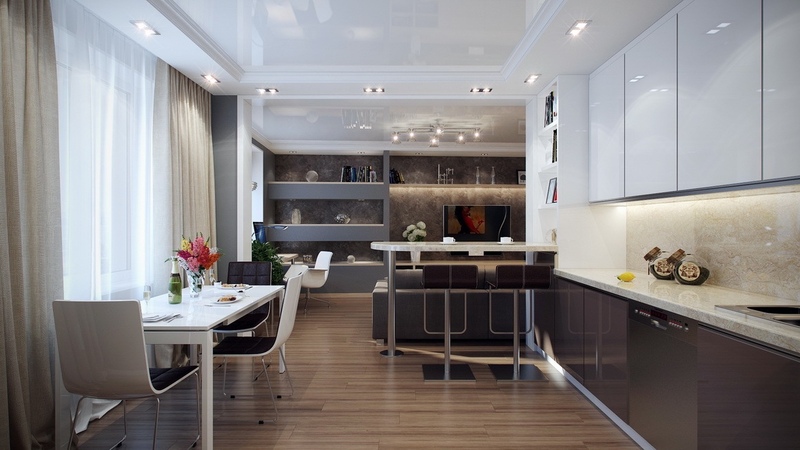 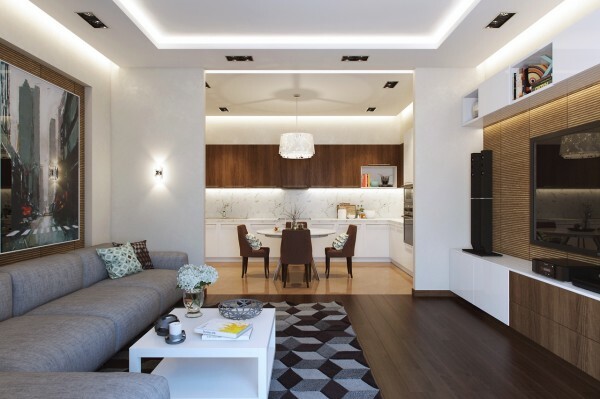 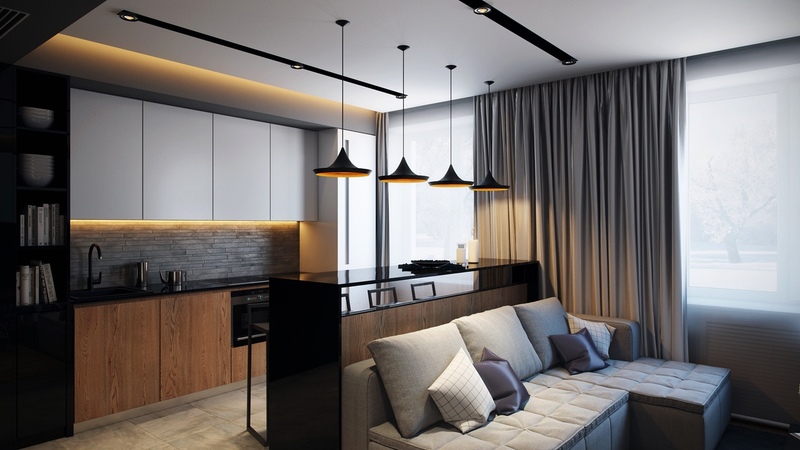 A smaller apartment with a gray and black theme uses particularly sleek countertops and a tufted sofa to point to luxury. 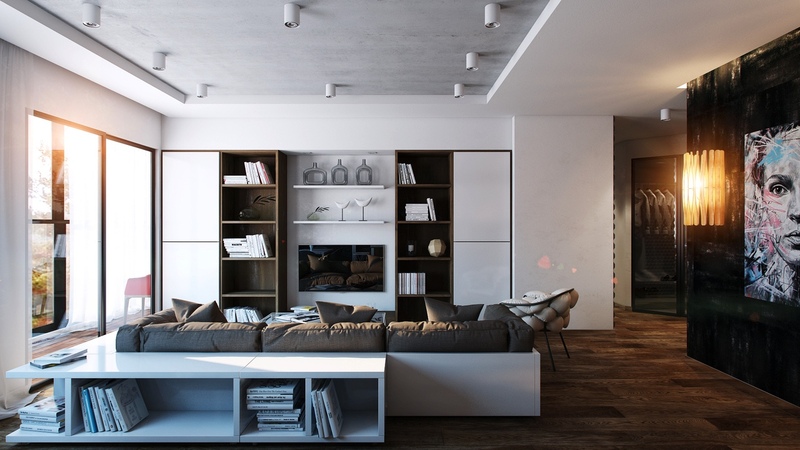 A soft white sofa and gorgeous natural wood floors are beautiful features in this fully feminine apartment. 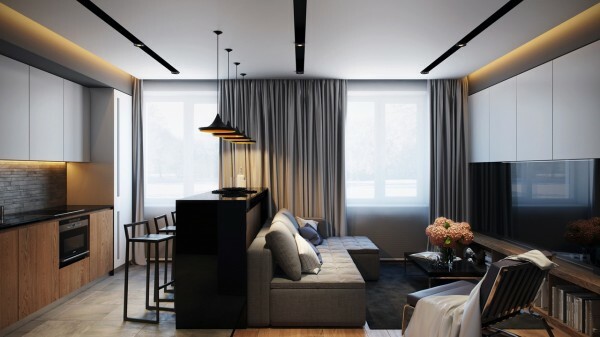 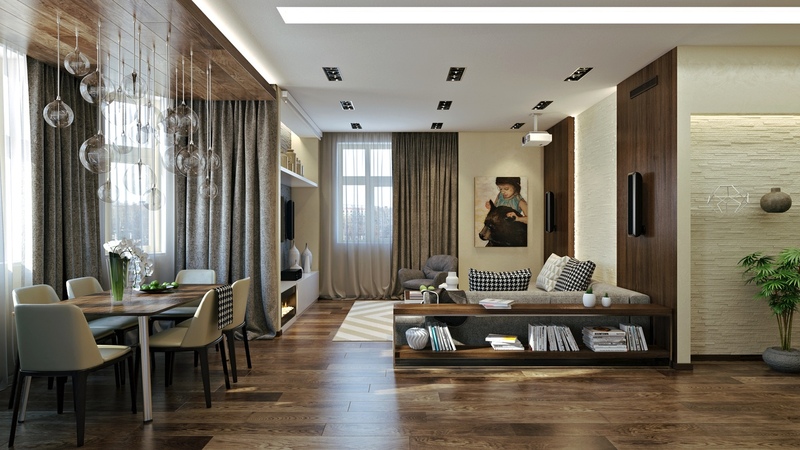 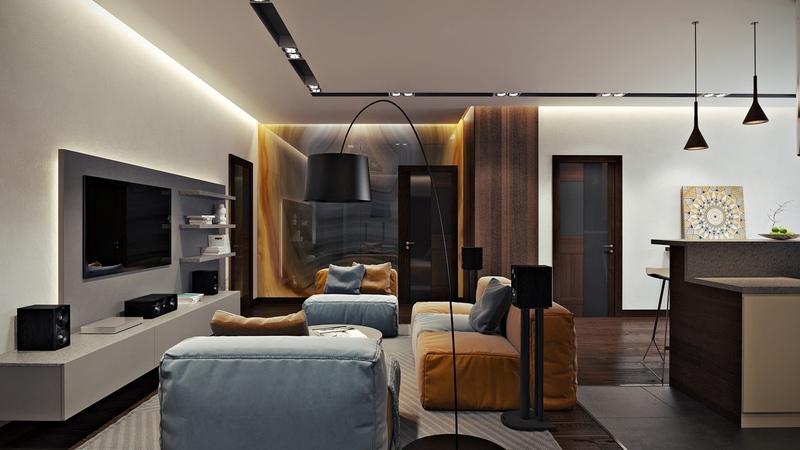 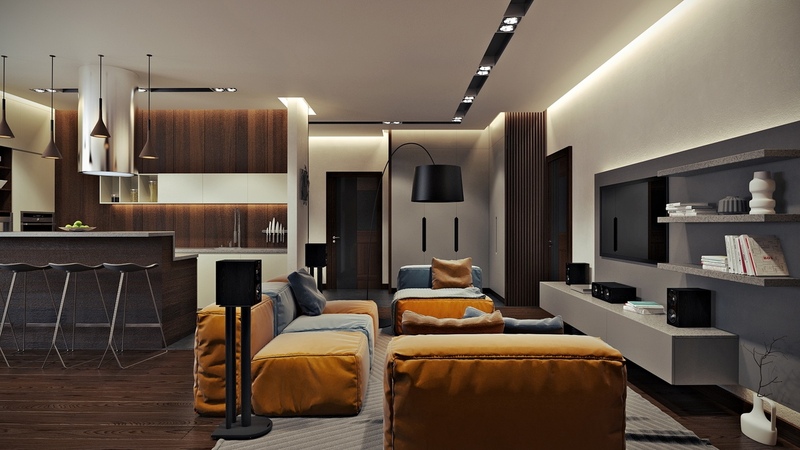 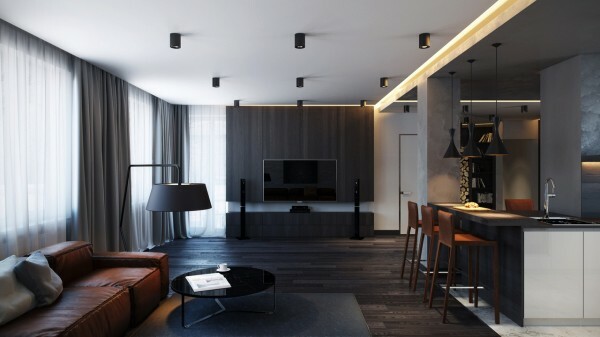 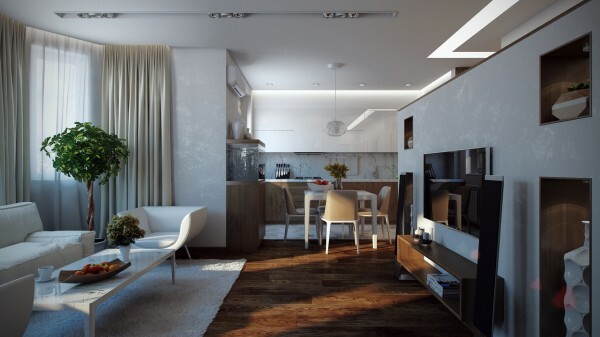 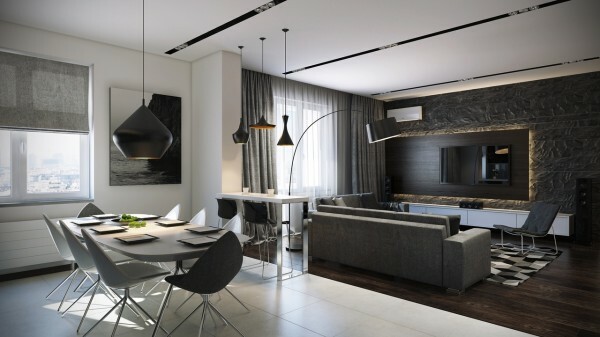 And towards the more masculine, bachelor design we have this dark gray and black apartment with another patterned area rug and smooth, creative light fixtures. 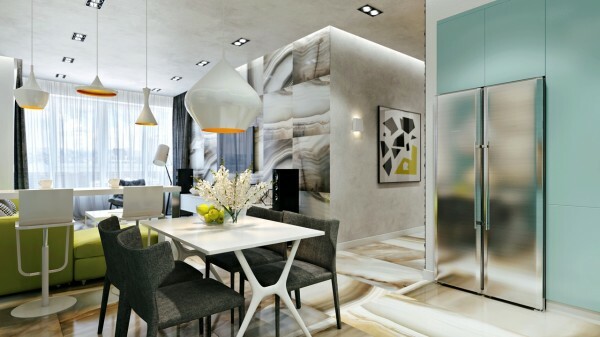 For an artsy turn, look no further than this sunny apartment. Cheeky pillows and cool, textured light fixtures give this apartment an immediate creative boost.